The Saudi artist Abdulnasser Gharem is known for his politically and socially engaged work that draws on his Muslim heritage. 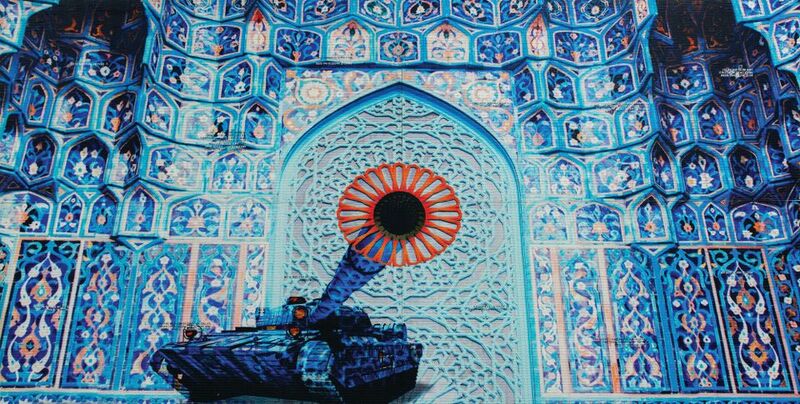 Gharem, who was until recently a lieutenant colonel in the Saudi Arabian army, opens his first US solo show at the Los Angeles County Museum of Art (Lacma) this month. The exhibition, organised with the King Abdulaziz Center for World Culture, includes 11 works, among them a new painting and sculpture, all of which were created with the 9/11 attacks on the World Trade Center in mind. Two of the hijackers were Gharem’s former classmates. He describes the attacks as a moment when “the world stood still”. We spoke with Gharem about the forthcoming show. The Art Newspaper: How did the exhibition at Lacma come about? Abdulnasser Gharem: In 2010, the arts initiative I co-founded, Edge of Arabia, did a show in the Kingdom Tower in [the Saudi capital] Riyadh. It was a small show, in a space like a corridor, but suddenly Michael Govan, the director of Lacma, turned up. He loved the works and we talked a lot. Soon after that, the museum bought its first piece of my work for their collection, the video The Path (Siraat) (2007). The museum has followed my work ever since. Lacma has the largest collection of contemporary Middle Eastern art of any US museum and, after Iran, Saudi Arabia is the nation most represented in the collection. What do you think fuels interest in art from these countries? I think Saudi Arabia and Iran have something in common in that the artists there don’t have platforms where they can display their art and discuss certain issues. The laws on freedoms in both countries make it hard to show works. The team at Lacma are like investigators and they discover these artists. They give us the space to say our statements without any pressure or influence. Your show comes at a time of difficult relations between the US and some Middle Eastern countries with President Trump’s recently re-imposed travel ban. Do you think it’s an important time to have a show like this in the US? Some of the works reflect on what’s happening both in Saudi Arabia and in the US. But I am not picking a side. I’m just trying to be a mirror to my society. I’m trying to activate people’s ideas and ideologies and ask them what they think. You recently established the Gharem Studio in Riyadh, which gives young Saudi artists space to work and share ideas and helps them build a network. Why did you open the studio? We don’t have a museum in Saudi Arabia and the studio is a humble effort. The younger generation in the country are so talented and no one is listening to their voices. I’m learning from them, to be honest. I’m an artist in Saudi Arabia and so I need to work on what I can do to help there. It’s a mission—it’s about doing more than just making works of art and hanging them in a gallery.